The Ricoh Aficio MPC3502AD features contemporary design with touchscreen, built-in storage, advanced fusing system for more savings, high quality print output and high-end security features making it ideal for a busy office. This multifunction device has scan, fax, print, and copy functions in one fairly compact but very upgradeable unit, but it is expensive. The Ricoh Aficio MPC3502AD is fairly compact for the small but growing office, with an understated but elegant frame that measures 880mm tall, 682mm deep, and 670mm wide. It boasts a large colour touchscreen operator panel and multiple interfaces, which include Ethernet, USB 2.0, and an SD card slot. This 120Kg device uses dry electrostatic transfer system for the copy process. It boasts a G3-compatible 33.6Kbps fax modem and a flatbed scanner. The Aficio MPC3502AD runs on two Gigabytes of RAM with a 250GB hard disk drive. It can print in speeds of up to 31ppm in either colour or monochrome, and it is easy to configure because of the large touchscreen panel. High capacity toners are available for the Ricoh Aficio MPC3502AD to maximise usage. Advanced user authentication and enhanced data encryption guarantee superb security. Timesaving features include direct USB key printing, an automatic document feeder, and a duplexer. 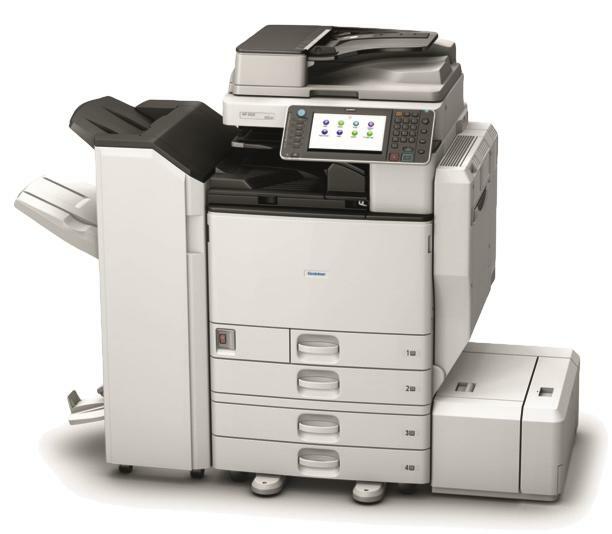 The copier of the Ricoh Aficio MPC3502AD can produce up to 999 copies. The memory is upgradeable to 1,500MB, and the maximum paper capacity is 4,000 sheets. Some important accessories like the finisher, two optional 550-sheet paper trays, the 2,000-sheet large capacity paper cassette, envelope feeder, punch kit, and the automatic document feeder handle are not included in the base unit and need to be purchased separately. The copy resolution of the Ricoh Aficio MPC3502AD is limited to 600dpi, which may compromise the quality of very detailed images and smaller fonts.